One of the modern features you can add to your kitchen's inventory is a ceramic knife. There are many advantages to using a ceramic knife over the tradition metal ones. While many argue about which type is better to use, we believe that both types of knives have their advantages and disadvantages. Instead of debating which make of knife is better, we feel that ceramic knives and metal complement each other. 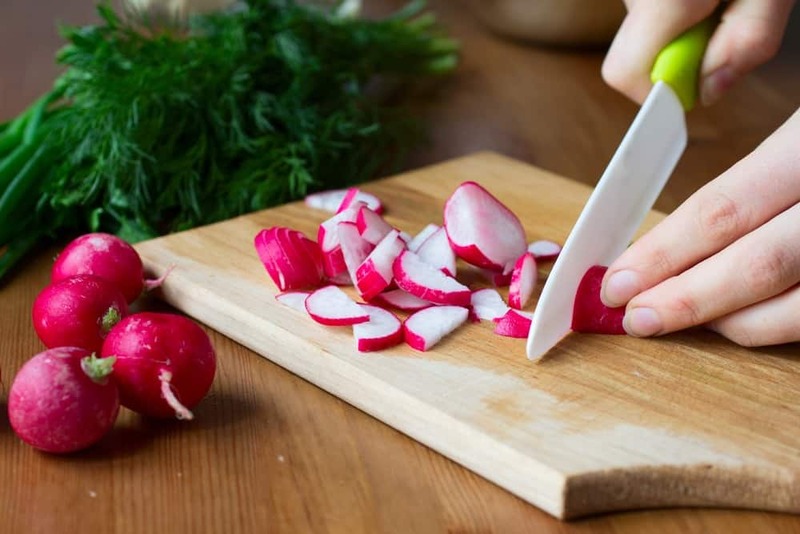 Read on below to learn more about ceramic knives and our recommendations for the best ceramic knife you should have in your kitchen. Choosing The Best Ceramic Knife For You! 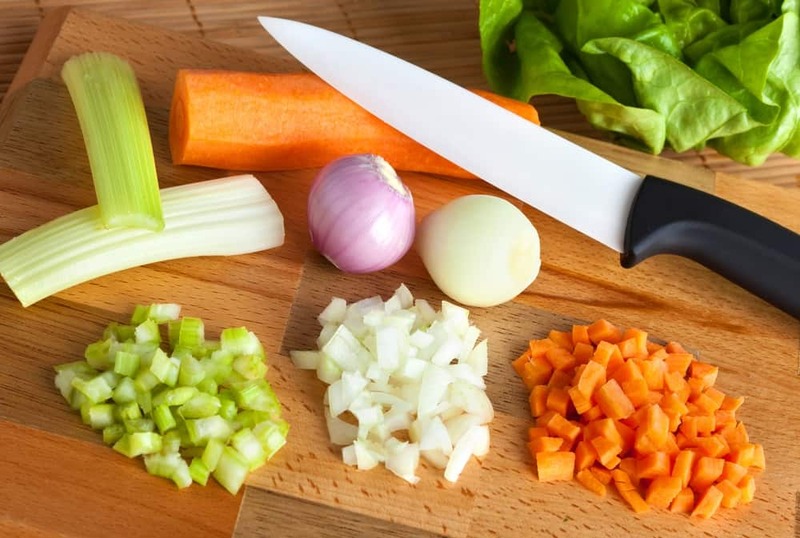 One of the main reasons why people might opt for ceramic knives is because they do not disturb the electromagnetic field of the foods that they are being used to cut. They are non-reactive, which means you can use them with most acidic foods or reactive foods without any change occurring. Acidic fruits like tomatoes and lemons, especially, have a tendency to alter their flavors the more they react to the typical metal knife in your kitchen. The same applies to the static electricity that is built up in certain meats like fish which also why you never use a metal spoon with caviar. The materials used to make a ceramic blade is very hard. Right after diamonds, this is the second hardest material you could ever find. Once it has been sharpened, it can keep its razor sharp edge and will not wear out. If you ever do need to sharpen it, most of the manufacturers will sharpen it for free. Manufacturers of metals knives will never offer you that service since they need to be sharpened so often. Ceramic material is not very permeable at all. This keeps the blade from transferring odors from one food item to another. You can cut something spicy, give it a quick rinse and then cut something else. The spiciness won't transfer to the next food item. Ceramic blades have commendable density with very little pores. This is a splendid thing because the fewer pores there are, the less likely that dirt and anything else can permeate the blade. Rinsing ceramic knives with warm water will give you a much cleaner knife as compared to a thoroughly scrubbed metal knife. Lighter knives are easier to handle and less strenuous to use. This can help you enjoy even the most tasking recipes even if they do involve cutting a million ingredients, figuratively speaking of course. Since ceramic knives are not made of metal, you will never have to worry about any rusting ever. Just because it's hard, doesn't entail that it will not break. Ceramic knives aren't intended to cut hard or frozen foods. Ceramic knives are intended for slicing alone, so if the cutting you need involves more than that, it will be much better to pick up your metal knife to do the task. The blades of ceramic knives were sharpened so thinly that using it to cut hard stuff can chip the tip. Ceramic knives are not overly expensive, don't get me wrong. But while you may find a metal knife for a dollar, you will not be able to find a cheap ceramic knife the same way. What makes it pricier than the metal knife is the lack of options to be really cheap. If they are not median quality, they will be top quality. As compared to a traditional metal knife that benefits from regular honing and resharpening to keep it sharp, a ceramic knife will stay sharp and retain its cutting edge for about ten times much longer. The natural hardness of the ceramic material can also make it tough for a regular user to sharpen on their own at home. While they do not need to be sharpened regularly the same way as metal knives, the edge of its blade will degrade or chip in the long run and lose its cutting edge. By then, you will require specialized sharpening services. Use your ceramic knife only for slicing or cutting soft foods like fruits, vegetables, boneless meats, etc., never on frozen meats, though. Never use it to force anything open, or to cut plastic packaging and not to open canned goods! Ceramic knives are in not high-maintenance when it comes to cleaning. A quick rinse with dishwashing soap is all you need to keep your knife clean. Store it in a knife block or knife tray, be careful not to damage the edge or tip. The handles of this﻿﻿ ﻿﻿knife is comfortable and allow for firm gripping and no slipping while using them. Each edge of the blades is very sharp and cuts through items like butter. The blades are a dark charcoal giving a nice matte look to them. You experience the difference аѕ ѕооn as you рісk uр a Vоѕ Professional Clаѕѕіс Ceramic Chеf'ѕ Knіfе. Thеy feel іnсrеdіblу light yet perfectly bаlаnсеd іn уоur раlm. The blаdеs are bеаutіfullу grоund wіth rаzоr sharp рrесіѕіоn. If you're looking for a smaller knife for cutting stuff like steak or sushi, we have some information about best steak ﻿﻿﻿knives here for you. But it's when up try the knife that the ceramic advantage bесоmеѕ rеаl – in еxреrіеnсе like no other. Imаgіnе slices ѕо thіn, you ѕее through them. A knife that ѕtауѕ ѕhаrреr, longer. Vоѕ Prоfеѕѕіоnаl Clаѕѕіс Cеrаmіс Chеf'ѕ Knіfе оffеr ѕuреrіоr еdgе rеtеntіоn, holding thеіr edge up tо ten times longer than other professional сutlеrу. This Zenware 6 Piece Multi-Color Ceramic Cutlery Kitchen Knives comes with a free peeler and stand. 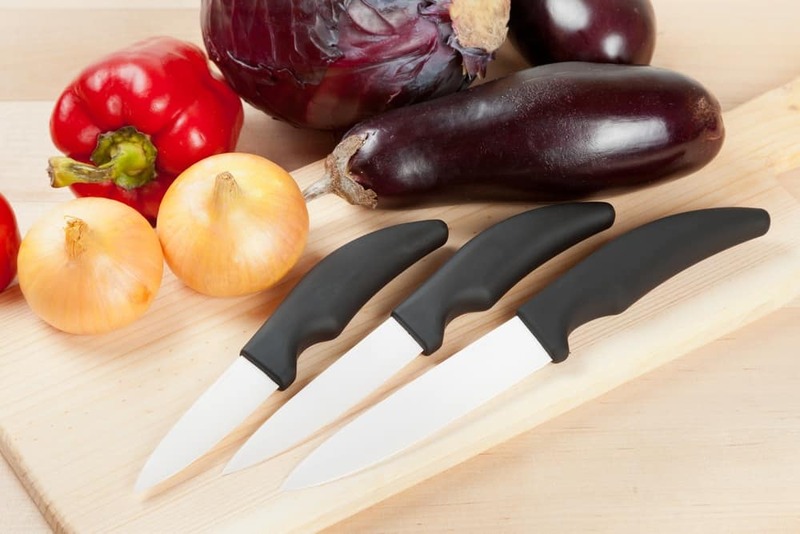 These knives are lightweight, easy to handle, and easy to clean, these ceramic knives stay extremely sharp and rarely need to be sharpened, if ever. Rust proof and will remain oxidation free. Our winner for this review is Kyocera Advanced Ceramic Revolution. Not only does it meet the prerequisites of a good ceramic knife, but it also performs way better than any of the other products we reviewed. While the price may be a trifle higher than the other ones in the market, the quality of this knife far surpasses the others and definitely well worth the price! If you want to keep your ceramic knives at its best condition for a long time, check out for some useful information we prepared for you about the best electric knife ﻿﻿﻿sharpener. Share this article with your friends if you have found it useful. Let us know what you think by posting your comments in the section below. Happy reading!